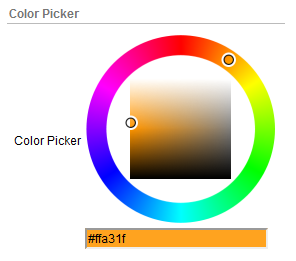 Home > APEX, Oracle, Plug-In	> My First APEX Plug-In – Color Picker. Thanks for saying it’s probably easier to write one of these than at first blush. I’ve played with V4, but haven’t delved into these yet. Nice little tool you’ve written! The interface looks very cool. I’ve used a jquery control in an app I did last year, and it’s wasn’t a walk in the park and I probably did it differently than you would have. Seeing that you’ve done that integration here has me thinking that building plug-ins to call some of the popular jquery controls would greatly benefit the Apex community. BTW, I found a small typo in this sentence “So, not I can use my Plug-In on any page of my application as easily as I could use any other item type in APEX.” I would have written privately, but couldn’t find your email address here. Exactly. I see many of the popular jQuery plugins turned into APEX Plug-Ins. Wow, only one typo. I’m ahead of the game in this post 😀 Thanks for pointing it out. Thanks for reminding me. I meant to add it there as well when I first blogged about it, but forgot. It’s up there now. Very interesting tool, Excellent work and Nice looking. Many thanks, really great effort. Parsing a CSV file in PL/SQL Yet Another APEX Blogger.